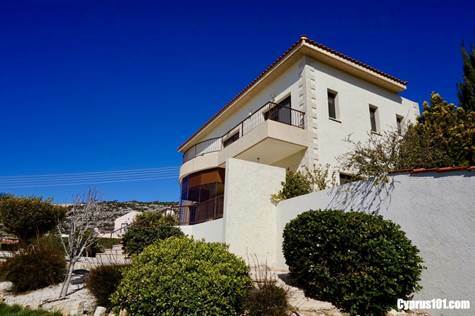 – This impressive luxury home is situated on an 804 sqm elevated plot in the popular village of Peyia. The property has been designed to take advantage of the superb panoramic coastal views from all aspects of the property, and is highly suitable as both a permanent residence and/or holiday home. With high quality finishes throughout, there are many extras including underfloor heating, double glazing, marble, granite & graffito finishes, fly screens and much more. The ground floor accommodation features a huge open plan living space, including comfortable seating areas, dining room and well equipped kitchen. A central glass frontage bay window and a number of sliding patio windows, provide lots of natural light and the stunning panoramic sea views can be enjoyed. The kitchen is nicely separated from the dining room by a breakfast bar and appliances include built-in double oven, microwave, gas hob, stainless steel cooker hood, American style fridge/freezer, integrated dishwasher and washing machine. Sliding patio doors provide easy access to a side patio. A sweeping marble staircase leads up to three double bedrooms, all with balcony access, walk-in closets and en-suite facilities. Both the master bedroom and second bedroom have direct access to a large balcony overlooking the swimming pool, and coast beyond. The third bedroom has a private balcony also with sea views. The “cable car like” views are equally fabulous from the swimming pool terrance and there is plenty of space for outdoor dining and relaxing. The mature landscaped gardens are designed with low maintenance in mind and a gated driveway and car port is situated at the entrance to the property. The property is maintained to an exceptional standard and comes fully furnished. Title deeds are available.